Today we awoke to our first true sunny day of the week! We met at school at 8:30 to head to Cahors, and we even had to use our sunglasses for the first time during the bus ride. On the way to Cahors, Olivier and I could hear a very heated debate about which was better: Google or Apple. The students never did come to a conclusion. After that, we heard them talking about which browser was superior: Safari, Firefox, or Google Chrome. There we were on a bus in the middle of rural France, and our ISTP students were talking about all of the tech companies from Silicon Valley. I even heard them mention Facebook. 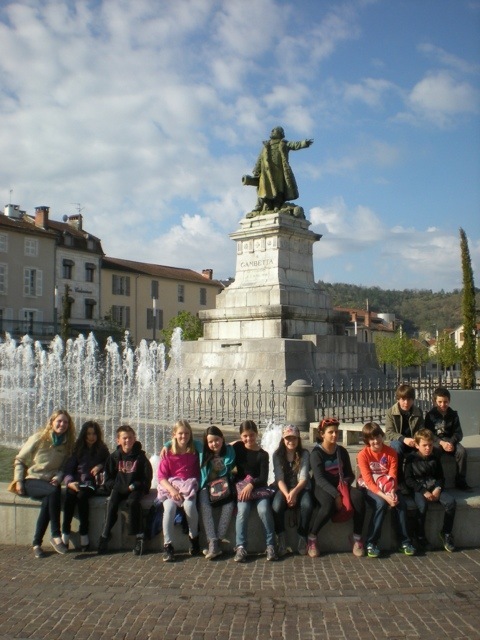 We arrived at Cahors a bit early and had a nice walk around before meeting our guide at the Pont Valentré. 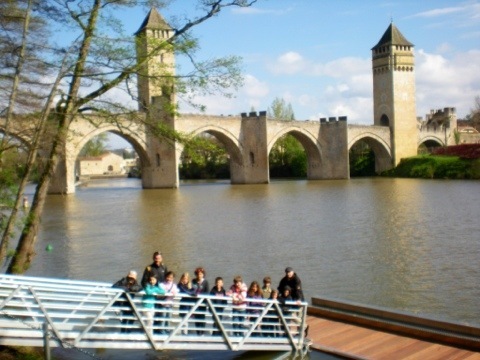 This bridge was constructed in the 14th century to defend Cahors. Our guide explained the legend of the devil that goes with the bridge. The man in charge of its construction was having trouble finishing the bridge and meeting the deadline. Legend has it that he made a deal with the devil to have the devil help him complete the bridge in exchange for his soul. Within several days, the bridge was almost complete, and the man began to think about the contract with the devil. He had three children and a wife, and he didn't really want to head straight to hell, so he decided to trick the devil. He told the devil to take a sieve down to the Lot (the river) in order to get water to mix the cement for the top of the last tower then the bridge would be complete. He was unable to get the water to stay in the sieve no matter how hard he tried, so the man and his crew finished the bridge without the devil, making the deal null and void. Legend has it that every night the devil comes to the bridge and takes out the last stone in the top of the tower to incomplete the bridge. In the 19th century, when the bridge was renovated, the architect had a man from Cahors sculpt a form of the devil removing the last stone, and it is represented in the top corner of this tower today. After the bridge, our guide explained how the residents of Cahors used the power of Le Lot to run their flour mills, and that it is used today to produce electricity. We walked a little further to a beautiful natural underground water source, La Fontaine des Chartreux, that is used to produce water for all of Cahors as well as extra to sell to neighboring towns. 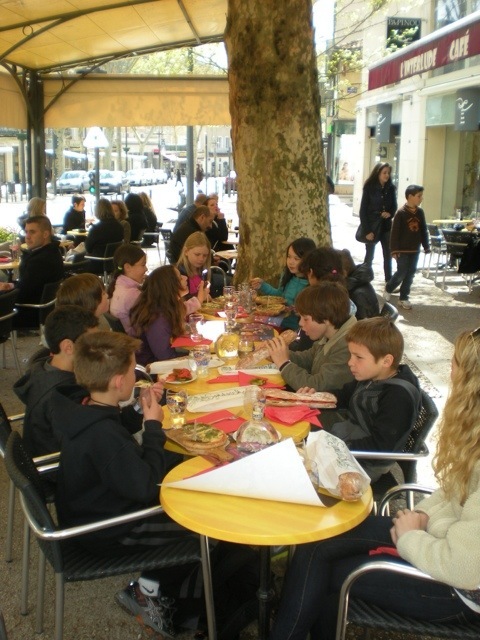 We returned to Cahors to have lunch in a café. It was even nice enough for us to eat outdoors on the terrace. Unfortunately, after lunch, while walking around Cahors, we were caught in a quick rainstorm. The children had already bought a few souvenirs and most stores were closed for lunch, so we went to the office of tourism to wait for our guide inside. There the students found some beautiful postcards. Our guide, Emanuel, was excellent. He brought us first to see the ruins of a roman amphitheater inside the parking garage by the Place Gambetta. While they were constructing the parking, they discovered this amphitheater, and it has been preserved inside the garage for all to see. He explained how a roman amphitheater was constructed and what it was used for. We then visited the medieval part of the city of Cahors. We saw several maison à colombage as well as some very small ruelles from the Middle Ages. We saw two medieval gardens near the cathedral. One of them was a garden of plants used for medicinal purposes. These gardens, around 25 total, have been recreated around Cahors to celebrate the gardens of the Middle Ages. We finished our visit of the village in the Cathedrale Saint Etienne where our guide explained the stories that the sculptures on the outside walls of the cathedral were depicting, where we learned about the stained glass and the frescoes depicting the story of Adam and Eve inside, and where we saw the beautiful cloister too. We had learned about the pilgrimage de Saint Jacques in the morning as the route passes by the Pont Valentré, and Emanuel had told us that these pilgrims could be identified by the 'coquille Saint Jacques' on their hat, bag, etc. One of our students was able to identify one sculpted on the wall in the cloister. Earlier, while visiting the gardens, we had seen a group of three of these pilgrims that we recognized by the scallop shell on their backpacks. These "pilgrims" were not what I had expected, and in fact, our guide explained that many participate in this pilgrimage today as a sort of unique (and perhaps spiritual) hiking experience and not necessarily a religious one. After the cathedral, our guide brought us to the bus, and we returned to Fumel. We met with the same classes that hosted us on Tuesday to say thank you and goodbye. There were lots of hugs and exchanging of contact info before everyone went home for one last night with their host family. Tomorrow, we get up early to bid farewell to our host families before heading to Paris. I'm sure there will be some tears on both sides as our students and their families have had a great week together!